Creating the components of your cabinets is one aspect of the job, but you also need to be able to assemble them quickly and correctly. Many cabinet shops manufacture cabinets at one location and then assemble and install at another (the customer's home, etc). When you flat-pack an entire kitchen's worth of cabinets so that it stacks neatly, it can quickly become confusing and frustrating to then put everything together correctly in the field. 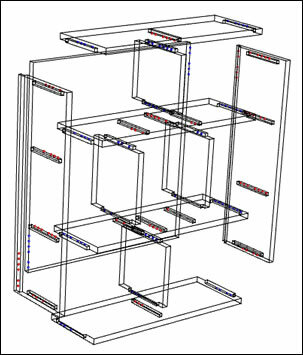 A typical nested based job consists of hundreds of parts representing perhaps dozens of cabinets, all intertwined into a series of nests. Your first task is to separate the parts into individual cabinets. This is normally done by placing labels on each part. Each label has a text statement with the cabinet name. Simply read the name and sort the cabinets by those names - sounds easy, right? While this sounds simple, it actually takes quite some time. You must read each label on the stacks of parts you are sorting to find the matching names for each cabinet (this can be a problem if your worker(s) don't read or speak English). This reading also takes time and parts sometimes have similar names so mistakes can be pretty easy to make. Time is money, and Thermwood has the solution to save you both in the form of our Patented Assembly Marks and Color Coded Labels. 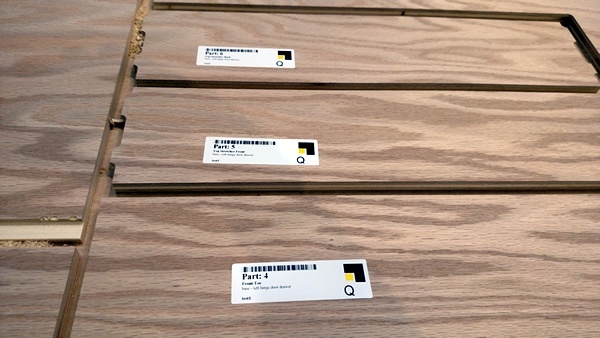 Thermwood’s approach prints a color bar on each label with a different color for each cabinet. (put the red parts with the red parts and the green parts with the green parts, etc.). This simple idea allows you to sort cabinets two to three times faster. This offers a significant productivity improvement. 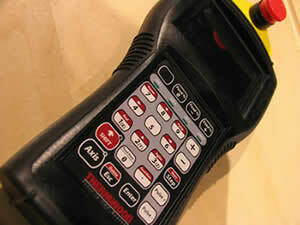 Each label also has a unique bar code that can be scanned to remake any damaged part(s) easily and quickly. Thermwood's Patented Assembly Marks are a significant productivity improvement when it comes to actually putting the cabinets together. 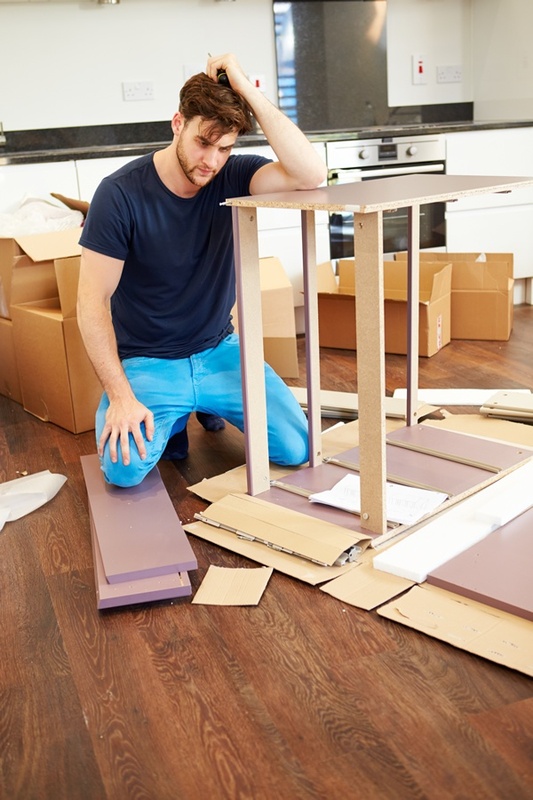 Simple cabinets are not all that difficult to assemble, but as cabinet designs become more complex, with fixed partitions, shelves or other features, determining exactly how to assemble the parts can become difficult. Generally you must create and print assembly drawings, and sometimes even with these drawings, the process of sorting out the structure can take significant time. Thermwood’s approach machines unique assembly marks into each joint to define which parts mate together. These marks are hidden once the parts are assembled. 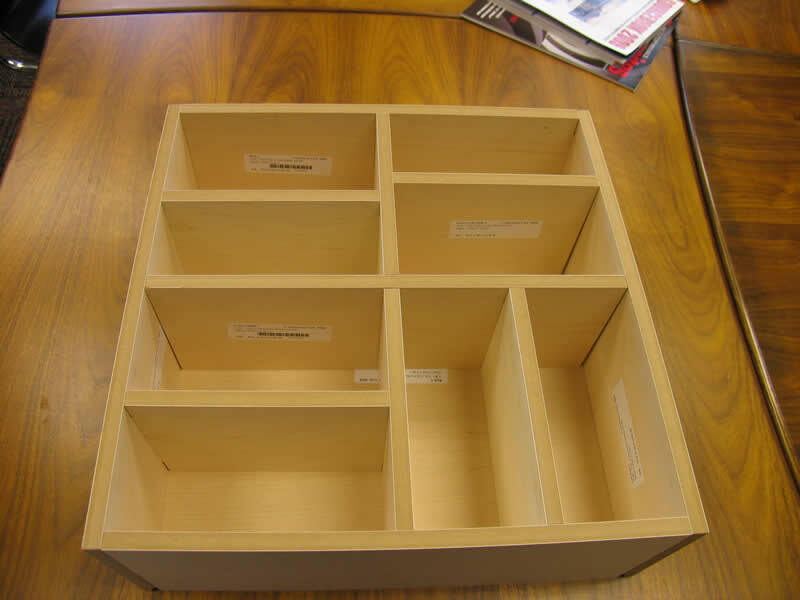 Assembly drawings aren’t needed and in fact, totally non-skilled workers can easily and quickly assemble even the most complex cabinets. One shop owner asked his cleanup man to assemble a cabinet as a test. This totally unskilled “cabinetmaker” assembled the cabinet quickly and accurately with no drawings or instructions. For most jobs this represents a significant productivity improvement that could rival the machining process itself. 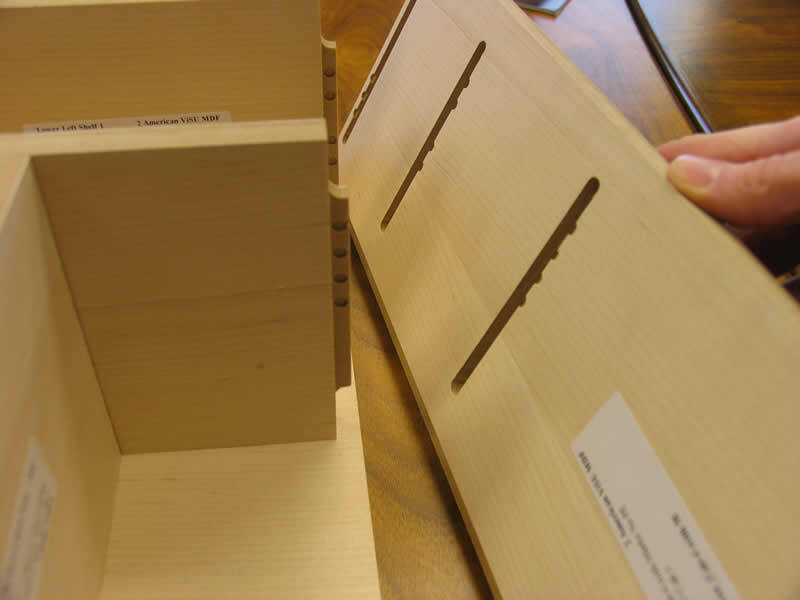 Thermwood's approach can save you significant time and money through the use of Assembly Marks and Color Coded Labels to improve your accurancy and productivity when sorting and assembling your cabinets out in the field. Thermwood at the 2011 AWFS Show in Las Vegas! 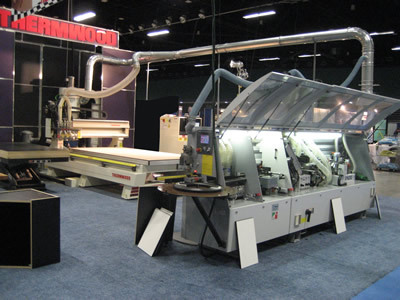 The 2011 AWFS Show promises to be an exciting opportunity to visit Las Vegas and see the very latest in CNC Router technology from Thermwood! 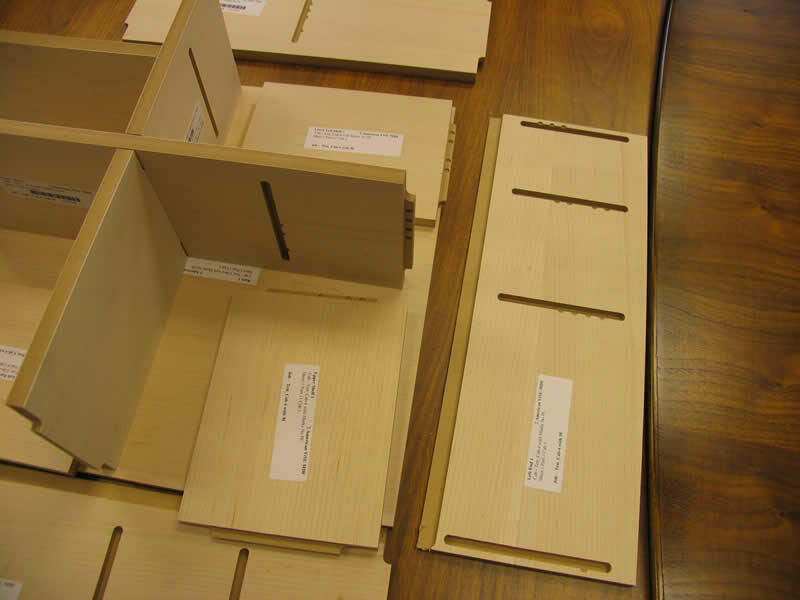 At AWFS we will be demonstrating the machining of custom nested based cabinets along with a variety of other applications including MDF doors, sheet plastics, and wood components. Our demonstrations will include machining products on our CabinetShop 45 CNC, complete with our new optional load/unload system that reduces labor and eliminates the need to load and unload material from the router. Also at AWFS we will be demonstrating the S400 and BEE Fravol edgebanders. 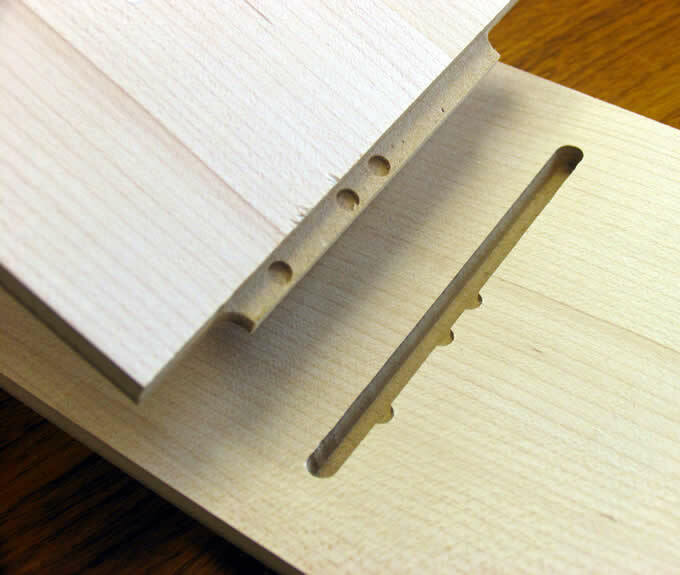 Fravol, known for high quality edgebanders, is exclusively represented and serviced in the US by Thermwood. The CabinetShop 45 will feature our new QCore SuperControl system. The QCore operates with Windows 7 Pro, has a massive 1 Tb Hard Drive for program storage, utilizes a Quad Core Processor and provides the highest level control platform for CNC router technology today. QCore also features an all-new optional Hand Held Programmer that puts the expanded power of the QCore control into a compact, rugged hand remote. This new hand held offers improved ergonomics, a color LCD touch screen display and a durable 24-key steel dome membrane keypad. It allows the operator to perform a wide variety of tasks that were previously only available through the machine control. Live streaming webcam from AWFS! We will be showcasing Thermwood’s speed and quality by running LIVE machine demonstrations using different materials such as plywood, melamine, MDF, Acrylic and King Plastics’ Starboard throughout the day – and available via webcam. Attendees will also have a chance to customize a product and run the machine yourself using our QuickCut software right at the control. Just select an item, change the size and watch the machine do the rest. If you’re interested in not just increasing throughput but also reducing assembly time, stop by Thermwood’s booth to see the latest in construction joints and assembly marks. We announced the new Barb Dado Joint at the IWF show in 2010, this year for AWFS we will be demonstrating our new Lock Dado Joint which combines blind dado and KD Fasteners (available from Hafele) making assembly unbelievably fast and easy! Plan to stop by Thermwood Booth #4210 and check us out! The AWFS show is located at the Las Vegas Convention Center and runs from July 20th-23th. We are pleased to announce a new, simplified approach to nested based production of cabinets and closets that does not require separate cabinet design software. This new approach, called "QuickCut", is done entirely at the CNC machine. The operator, working at the machine control, simply selects and resizes cabinets and closets from a built-in library and runs them. This entire process happens at the machine. The process is simple enough that virtually anyone can run it with minimal instruction. Libraries can be modified or extended through a programming service. "For the first time you can operate a CNC router without extensive training or technical skill", says Thermwood's Vice-President of Marketing Jason Susnjara. 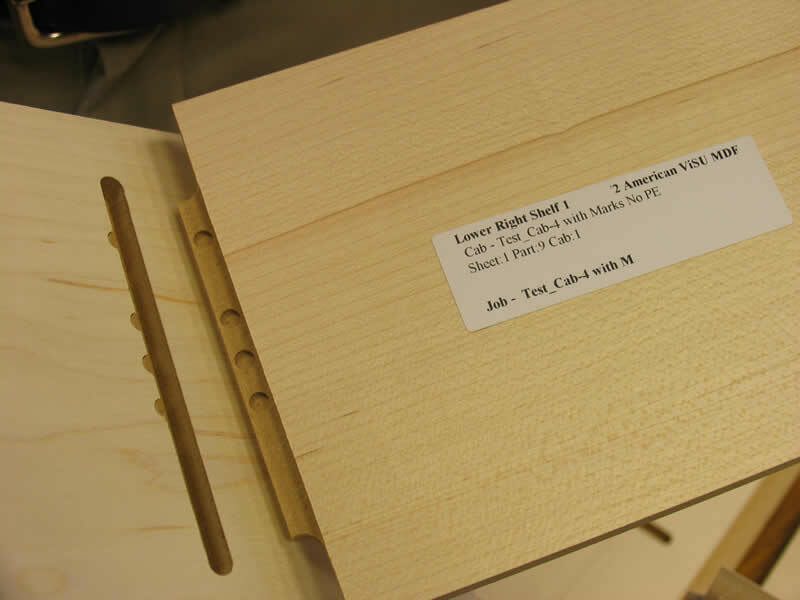 "This approach allows cabinetmakers to focus on making cabinets using an amazing new tool that's really easy to use". 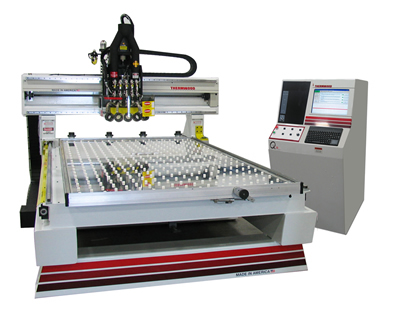 Operating a CNC router usually requires specialized knowledge which limits its use to specially trained employees. We used the technical power in our Gen2 SuperControl to totally automate virtually every task, then created a simple user interface, resulting in a system that almost anyone can use without extensive training. The QuickCut feature targets smaller, less technical shops but can also be used by larger companies to make virtually any part or product in their product line any time they want. A library of parts can be stored on a network drive. At that point, almost anyone can walk up to any QuickCut machine and make any part. It's that easy. By storing files in a central location, management has complete control of anything that is made, anywhere in the factory. "This new interface takes what has been a confusing area for non-technical users and makes it almost as easy as using a copy machine", states Thermwood's President, David Hildenbrand. "We believe it will fundamentally change how cabinets, closets and perhaps many other products, are made". All nested based systems from Thermwood are QuickCut compatible and Gen2 systems operating in the field can be retrofitted to make them QuickCut compatible. For more information on this exciting new development, please visit our QuickCut area of the website. Below is a photo of our booth before the Carolinas Industrial Woodworking Expo 2009 that was recently held in Greensboro, NC. If you missed us here, you can see us at the Mid-Atlantic Industrial Woodworking Expo in York, PA on April 2nd and 3rd, 2009. Hope to see you there! You can find out more information on our trade show schedule by visiting our trade show calendar. Another even more significant productivity improvement involves actually putting the cabinets together. Simple cabinets are not all that difficult to assemble so major productivity improvement is not likely but as the cabinet design becomes more complex, major productivity improvements are possible. Once fixed partitions, shelves or other features are added to a cabinet, determining exactly how to assemble the parts can become difficult. Generally you must create and print assembly drawings and even with these drawings, the process of sorting out the structure can take significant time. 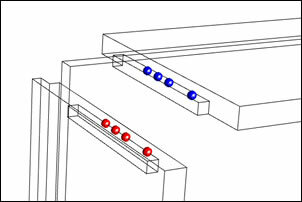 Thermwood’s approach (also patent pending) machines assembly marks into each joint which define which part mates with which part. These marks are hidden once the parts are assembled. Assembly drawings aren’t needed and in fact, totally non-skilled workers can easily and quickly assemble even the most complex cabinets. One shop owner asked his cleanup man to assemble a cabinet as a test. This totally unskilled “cabinetmaker” assembled the cabinet quickly and accurately with no drawings or instructions. For most jobs this represents a productivity improvement that could rival that realized for the machining process itself. So when looking for productivity improvements from CNC routers look to the supporting or peripheral processes and the impact you could have on downstream processes. Right now, today, that’s where the greatest return can be found. Note: Thermwood has applied for patent protection on the assembly marks, color and symbol coding of labels and the supporting software for these. They will provide a royalty free license under any patents issued for any parts made on a Thermwood CNC router and has offered a royalty free license to software developers for file output to Thermwood CNC routers.